While Rafer Johnson is known for many things, his success as an Olympic decathlete in 1956 launched him into the public eye. Decathletes must possess unique traits which enable them to compete in such a mentally and physically exhausting event. Exceptional strength and endurance paired with the psychological qualities of discipline, determination, and a positive outlook are often found in decathletes. For decades now Rafer Johnson has exhibited these traits on the field and in his own personal life. Rafer Johnson has an impressive history of athletic achievements and exceptional contributions to his community. Clearly, Rafer was admired and respected by his peers as a youth; he was elected student body President in grade school, sophomore class President, and student body President again his senior year. Rafer was also an A-student and member of the California Scholarship Federation. While Rafer excelled off the field, his achievements in baseball, basketball, football, and track, certainly did not go unnoticed. He captained three of these high school teams and earned 11 varsity letters. His high school track coach, Murl Dodson, saw in Rafer a capacity for something bigger than individual sprint races or high jumping. In 1952, when Rafer was just 16 years old, Coach Dodson took him to nearby Tulare, California to watch the national Amateur Athletic Union’s decathlon. The event piqued Rafer’s interest, and the rest is history. With the 1956 Summer Olympics in his sights, Rafer trained harder than he ever thought possible. He graduated from high school and went on to UCLA, where as a freshman he competed in his first decathlon in 1954 with extraordinary results. On top of his strenuous training schedule, Rafer continued a high level of extracurricular involvement during college. He was a member of the Air Force Reserve Officer Training Corps, Pi Lambda Phi fraternity, and the Campus Crusade for Christ. After earning the Silver Medal in the 1956 Summer Olympics in Melbourne, Rafer spent several months rehabilitating an old knee injury, which had resurfaced during his time in Melbourne. Being the good-natured competitor he was, Rafer used this time to go on an international “goodwill tour” arranged through the U.S. Department of State. However, he quickly resumed his demanding training schedule, driven to succeed at the 1960 Summer Olympic Games. Succeed he did. Rafer won the decathlon with a record-breaking 8,392 points. 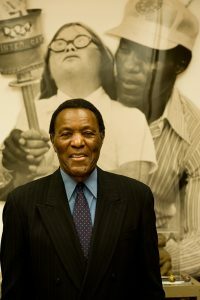 Rafer Johnson founded the California Special Olympics and served on the board of the Special Olympics for many years. After his enormous success at the 1960 Olympics, Rafer became acquainted with Robert F. Kennedy. The two men became close friends over the next few years, and Rafer was alongside Senator Kennedy during his California primary victory celebration. The event proved tragic, as Senator Kennedy was shot and killed by a man named Sirhan Sirhan. Rafer acted quickly and tackled the gunman to the ground, preventing him from escaping. The weeks following the tragedy were extremely difficult for Rafer as he mourned his friend. Eunice Kennedy Shriver, Senator Kennedy’s sister and founder of the Special Olympics, reached out to Rafer and asked him to join her for the first ever Special Olympics World Games in Chicago. The event was life changing for Rafer, and he was inspired to bring the Special Olympics to California. 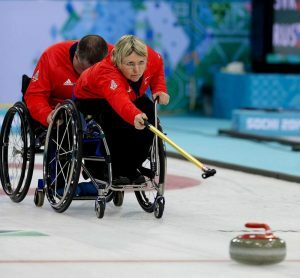 The following year in 1969, Rafer, along with several other volunteers, brought the games to the Los Angeles Memorial Coliseum in which 900 individuals with intellectual disabilities competed. This was just the beginning of decades of work with the Special Olympics. In 1983 Rafer was elected President of the Board, and in 1992 he was named Chairman of the Board of Governors for the Special Olympics. His humanitarian work has included being involved with the HERSHEY’S Track & Field Games, Kids in Sports in Los Angeles, New Directions, and countless other organizations over the years. In our Athletes in Excellence, we seek traits and behaviors which inspire others to become their very best. Rafer Johnson is the epitome of an Athlete in Excellence. His positive outlook and determination on and off the field has yielded a lifetime of positive results. His sense of community shines through his involvement in organizations and being a part of something greater than himself from an early age. We are inspired by his work, and we hope you find his story as encouraging as we do. Many thanks to Anita DeFrantz of the LA84 Foundation for nominating Rafer Johnson to receive the Athletes in Excellence Award. Learn how to nominate an athlete for the 2015 Athletes in Excellence Award!